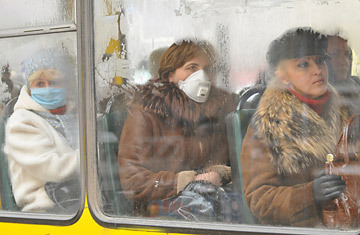 Swine-Flu Panic in Ukraine: Crisis or Political Ploy? To be sure, flu is spreading in Ukraine, with the government reporting more than 600,000 cases in the last week. The Health Ministry said Thursday that 95 people have died from the flu or respiratory infections, although it's uncertain how many of these deaths have been caused by the H1N1 virus and how many have been the result of seasonal flu. The World Health Organization says it's safe to assume the H1N1 virus is widespread. Given the persistent rumors and the country's volatile political situation, however, some Ukrainians have suggested that the gravity of the situation is being exaggerated by Prime Minister Yulia Tymoshenko for political gain ahead of the January presidential elections. "What has happened is hysteria and panic, which is being provoked," says Arseniy Yatsenyuk, a presidential candidate currently running third in the polls. He accused Tymoshenko of whipping up a frenzy to distract people from the government's failings. "Is anyone talking about wages? No. Is anyone talking about the 4 million unemployed? No. Is anyone talking about the gas we haven't paid for? No," he says. The media have also questioned Tymoshenko's motives. A headline on one Ukrainian news website, Ukrayinska Pravda, read: "Who needs swine flu and who needs a high rating?" Others are taking the flu pandemic more seriously and are blaming Tymoshenko for mishandling the government's response efforts. Viktor Yanukovych, the leader of the opposition and front-runner in the presidential race, has called for the Health Minister to be fired and accused Tymoshenko of putting people's health at risk by launching her own presidential campaign with a rally just six days before the ban on public gatherings was announced. "Tymoshenko knew she shouldn't bring such a large number of people to Kiev. It was a feast at the time of a plague," he says. Current President Viktor Yushchenko  Tymoshenko's former partner in the 2004 Orange Revolution and now her bitter rival  also attacked her for holding a campaign rally, saying it was "criminal irresponsibility" if it allowed the disease to spread. But Tymoshenko has also been praised by many for implementing sweeping measures to try to stop the spread of flu. She has made every effort to appear on top of the situation, personally going to meet a shipment of the H1N1 vaccine Tamiflu at Kiev's airport on Monday. One doctor who asked not to be named in the hard-hit Lviv region praised the Prime Minister's actions. "Politicians are aggravating the situation by making so much noise," she tells TIME. In addition, Glenn Thomas, a spokesman for the WHO team that's been dispatched to Kiev to assist Ukrainian authorities, says the government's response had been "transparent and rapid." Taras Berezovets, an adviser to Tymoshenko, tells TIME that Yushchenko and the other presidential candidates are using the swine-flu epidemic as an opportunity to attack the Prime Minister. "The media are to blame for the panic. From the beginning, the government has told people to remain calm and follow some simple rules," he says. Tymoshenko has been guilty of one thing: sending mixed messages. The closing of schools and banning of public gatherings are among the harshest measures in Europe against the H1N1 virus. Yet Tymoshenko has not forcefully advocated for people to get vaccinated against the virus. "I am not vaccinated," she said in a television address this week. "I am protecting myself like everybody, with lemon, onion, garlic, everything that is needed. I think the best way is simply to protect your health through well-known means." Yushchenko, meanwhile, has urged people to get vaccinated immediately. Everyday Ukrainians are used to the political bickering that has beset their country since the Orange Revolution five years ago. Many people are looking after themselves because they don't trust the government to do anything for them. The folk remedies advocated by Tymoshenko are growing in popularity, as are slightly stronger tonics. "A vodka a day keeps swine flu away," one elderly woman told masked passersby on the street. See the top five swine-flu don'ts. See pictures of the swine-flu outbreak in Mexico.